Mr. Calvin’s Bouncers brings the party to your door in Little Rock, AR with inflatables and jump houses. Mr. Calvin’s Bouncers offers a variety of inflatable jumpers for corporate parties and school events. Mr. Calvin’s Bouncers will bring in the fun, one party at a time. 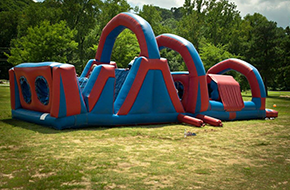 We offer a variety of inflatables for rent in Little Rock, AR. Our bounce houses are a great way to keep kids entertained and are a big hit at all types of events. Our commitment to customer service and low prices makes us one of the leading inflatable rental companies in the area. Our bouncers are a smart addition to birthday parties. 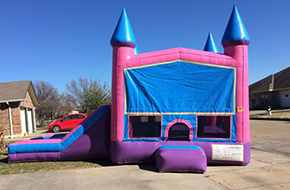 We offer bounce houses in several styles for girls and boys. Our high-quality jump houses are easy to set up and work well in backyards and park settings. When you order a bouncer from Mr. Calvin’s Bouncers, we come to the party, set everything up, and remove the bouncer for you when the party is over. 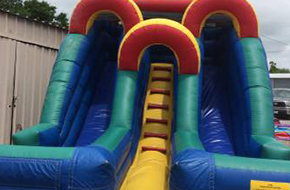 If you are hosting a corporate party or company picnic, Mr. Calvin’s Bouncers is ready to bring the fun. We offer jump houses, obstacle courses, and other exciting inflatables. Our newest addition is a mountain climber that stands 28 feet tall. We carry water slides that even the adults will enjoy. We offer tables and chair rentals, too. Call Mr. Calvin’s Bouncers for school carnivals and fairs. Our jumpers are ideal for fundraisers and fall festivals. Our selection of high-quality inflatables is popular for church celebrations and youth camps. Any time kids gather is the right time for Mr. Calvin’s Bouncers. Our bouncers and jumpers are fun for family reunions, summer get togethers, and holidays. We are here to help you choose the best inflatables for your event. Get in touch with Mr. Calvin’s Bouncers in Little Rock, AR today!